Wow!! What can I say about a wine that is nothing other than WOW! My girlfriend and I went wine tasting a few Sundays back,we were having a really good time and I was excited to try a new winery. Otis Kenyon had been on my agenda for some time and I definitely made them my target. Pat, our tasting room host immediately greeted us and we dove into some of the best Washington state wine that I have tasted to date! The Otis Kenyon name and label celebrates a storied family history steeped within the walls of the Walla Walla Valley. It’s a fascinating story that dates back to the early 1900’s and I invite you to visit their informative website and relish in an interesting tidbit of Washington Wine history. Winemaker Dave Stephenson with owners, Steve Kenyon and Deborah Dunbar source their grapes from their own mature 10-acre Stellar Vineyard that bears Cab, Merlot and Syrah grapes. They prefer a more dry farmed varietal. Otis Kenyon also takes advantage of other gorgeous Washington slopes, such as Horse Heaven Hills. The family has another 29-acres that is waiting to be cultivated and features Bordeaux and Rhone style varietals. Boy, I can not wait for that to mature into a beautiful wine product that I know will only come from Otis Kenyon. I have to say that I particularly love their 2009 Petit Verdot, it may be my favorite on the market. What a unique earthy taste with a sensual blend of deep spicy flavors that follow all the way through with a bitter chocolate. Otis Kenyon also serves a nice bottle of 2006 Reisling that is a lovely crisp dry drinking wine, that would match any beautiful summer day. Take an adventure and experience Otis Kenyon’s amazing history. 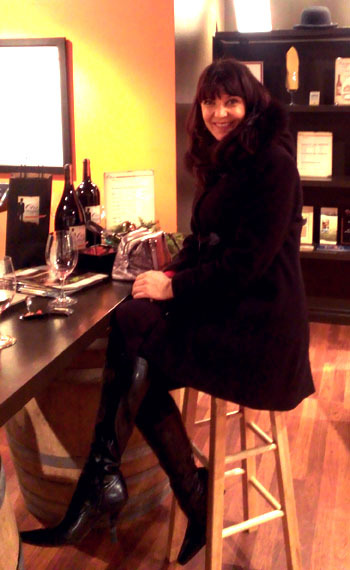 Visit Pat in Woodinville at the Apple Farm Village and she will lead you into wine Heaven. Mike and I went to the Legendary Swirl event at El Gaucho in Seattle last Saturday and we had a blast! I was able to talk with so many vendors, winemakers, and reps. They were all interesting and had a deep commitment to the wine that they created or represented. I had such a wonderful time talking to the people that I met, that I was not able to tour the full spectrum of the event. I was so intrigued with what everybody had to say about their wines, how they are produced, the stories behind the vineyards, and the passion involved! I got a re al sense about how wine is an art and a science rolled into one. One of the most intriguing things about the wine industry is the way it blends art and science together – the blending, the color, the taste, the smell, the processing, and the beauty. It is truly amazing how genuine works of art can be produced through a mastery of science! The Swirl also showcased some really beautiful wines from Italy and South America. El Gaucho rolled out some lovely hors d’oeuvres for the wine event and if you chose to stay for dinner they had a beautiful five course wine pairing. This event comes once a year, check to see if your favorite winery is attending, make reservations and go! It is a lot of fun and we got to meet some really neat people, both those representing and those attending, who love wine as much as we do!! Mike and I were out doing our favorite past-time, wine tasting! We had the pleasure of having his sister and a mutual friend with us, what a good time we had! Our first stop was at Amavi Cellars and we had the pleasure of meeting Brian Dennis, the tasting room host. He was very charismatic and knowledgeable about the wine he poured and was very willing to pass out any paraphernalia containing information about Amavi. One interesting tidbit we learned was that Amavi Cellars is a sister to Pepper Bridge Winery, they share a beautiful estate in Walla Walla near the Oregon border. They also source from their own estate vineyards, which consist of Seven Hills, Pepper Bridge, and Les Collines. I enjoy the earthy taste that Jean-Francois Pellet, winemaker partner, produces in his wines! I can appreciate the great care he takes in cultivating his wines in a natural way that preserves the grape. I found the 2011 Merlot a very lovely social wine with a summery feel. I really wanted to try a nice white and I learned that they carry a beautiful Semillon, that earned 91 points in Wine Enthusiast-editor’s choice, but they were all sold out. Wow what an interesting tasting by accident! I was researching organic wines and I came across Pleasant Hill Cellars. I gave them a call to retrieve information on organic wine only to find out that they didn’t produce organic wine. I had the privilege of speaking with Larry Lindvig, one of three winemakers that produce out of Pleasant Hill Cellars. He was very invigorating and passionate as he spoke to me about their wines and I was sucked in just by listening to him. Larry invited my husband and I to their industry tasting the following day at Sky River Meadery in Woodinville and we surely went as I was quite intrigued to see how three different labeled wine makers interpreted grapes from the same sources.